So lets talk denim. I don't know about you, but I personally live in jeans. The past few weeks have been so cold that jeans are naturally an obvious choice and 100% my go-to when getting dressed in the mornings. 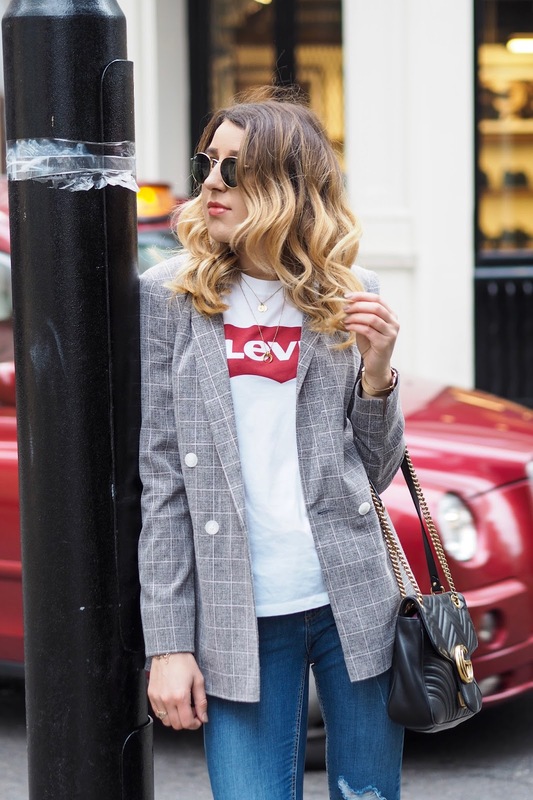 Whilst I feel that most people favour a particular cut when it comes to their jeans, I have definitely been more experimental in the past few years when it comes to denim. Once upon a time you would only see me in skinny jeans and now I can proudly say I own boyfriend, girlfriend, Mom and straight leg jeans. One would say I'm quite the jean queen. In today's post I have teamed up with Debenhams to not only show you the versatility that jeans can bring but also how I wear mine for varying occasions from everyday wear to dinner and drinks with your no.1 huns. 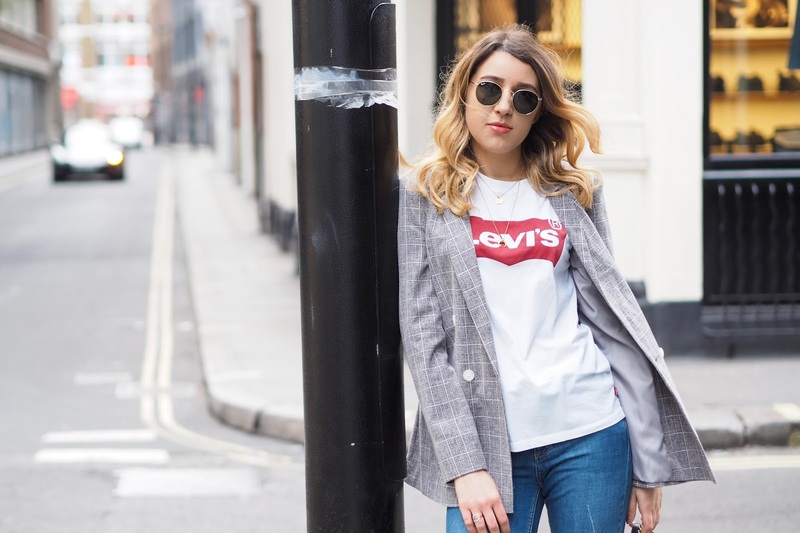 Debenhams challenged me to choose two styles of denim to create two different looks, so I hope you like how I've styled both pairs in today's post. 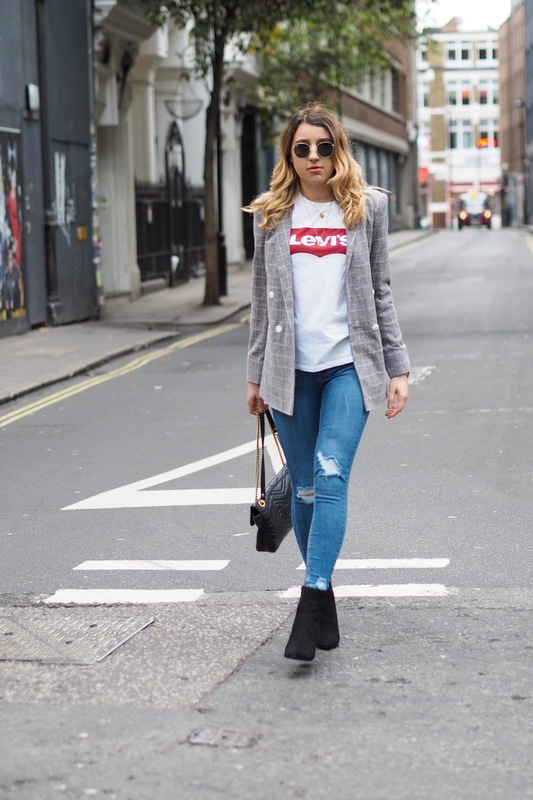 There really is a pair of jeans for every occasion and hopefully today's post will give you some inspiration on how to wear your favourite denim or even better perhaps experiment with a new style. So I have a slight confession. I went off skinny jeans for a while. I just didn't like the way my legs looked in them but I am absolutely loving these blue denim skinny jeans and you can't go wrong with a subtle rip despite the "has the dog been at your jeans" comment you'll definitely get from your grandma. 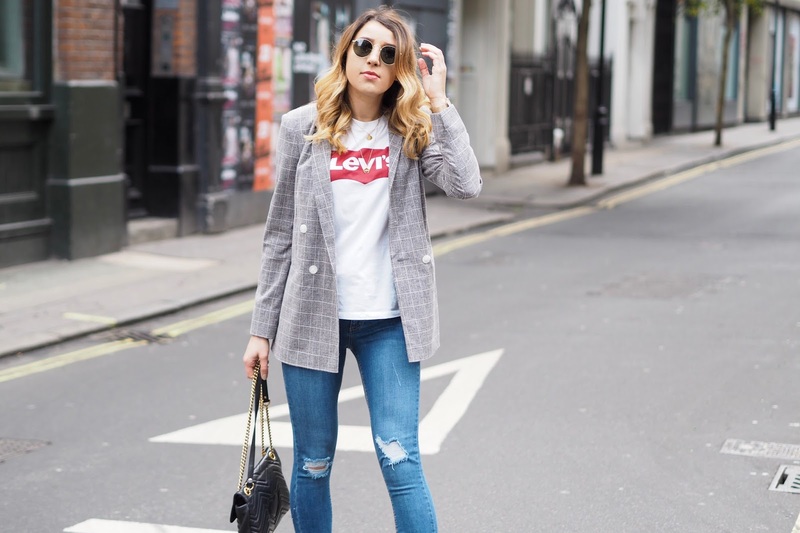 Here, I have paired these skinny jeans (which I am wearing in a size 8 btw) with a slogan Levi's tee and blazer to smarten up the overall look. 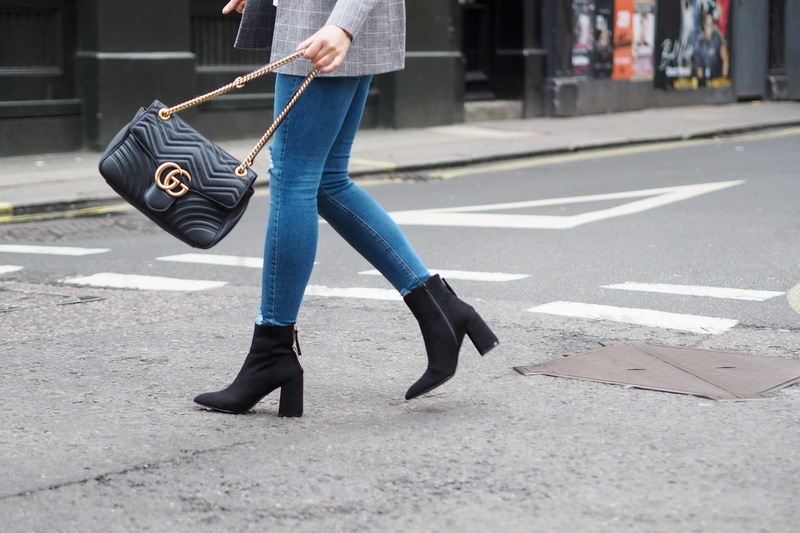 In my opinion this is a great day-to-night option and if you wanted to make it slightly more dressy could simply switch the ankle boots for a pair of heels and accessorise with a clutch bag for a more evening appropriate look. This check blazer I absolutely love and it's definitely something I will be getting lots of wear out of over the next few months. I also think it will look super cute layered over dresses for spring. Don't you think? I'm sure every girl can relate with me when I say there is a confidence that comes with finding a pair of jeans that indeed fit you like a glove. It's almost like you walk in a different way, the jean strutt effect as I like to call it. Personally, I've never been a huge fan of overly structured denim. I prefer a slightly thinner denim that has a bit of stretch and these skinny jeans are just that. Quite high waisted, with a good stretch and super flattering in all the right places. Yaaaaay! This second look is basically my go to everyday look. 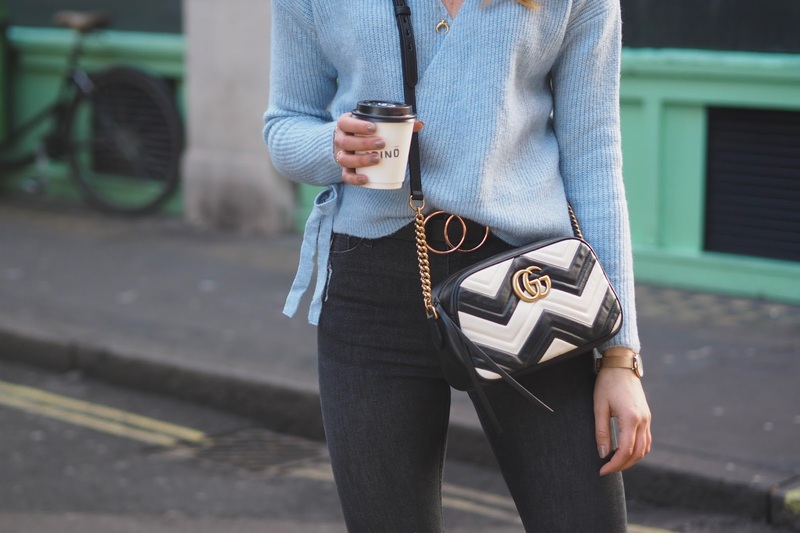 You just can't beat a jeans and jumper combo and I literally love this baby blue wrap over jumper. It reminds me of my wrap over jumper I had as a child that I used to wear over my leotard for my ballet lessons. It so cute and even cosier which is just perfect for this weather. I like the contrast of the black wash skinny jeans and the rips add an edge that steers this look away from being too feminine. Which is just in fitting with my overall style. This is the first time I've actually owned a pair of black wash jeans like the ones pictured above and I must say I'm such a fan and they make a change from your classic black skinnies. 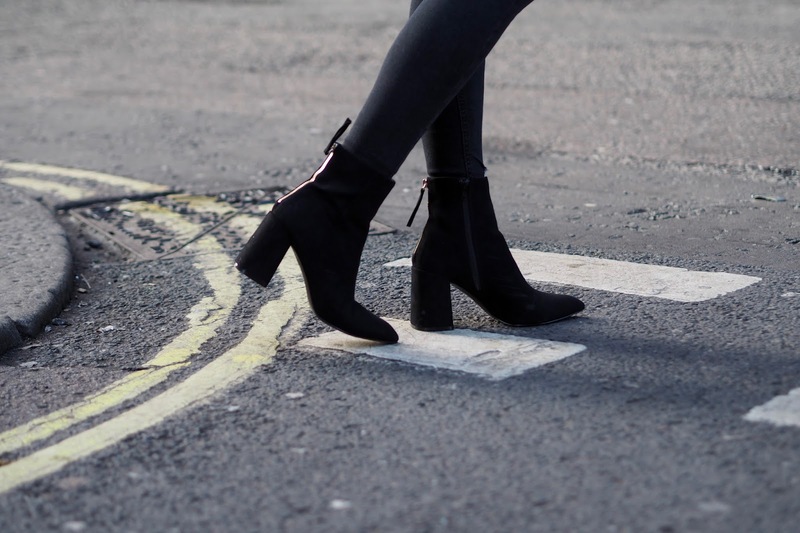 The rips add an off duty edge and I think they'll look just as good paired with trainers as they do with these heeled ankle boots. So I'd love to know which is your favourite look out of the two? I really like both in equal measures but I do always gravitate towards a cosy knitted jumper because it's just that....COSY and this wrap jumper is so soft and snug that I literally don't want to take it off. I have included all the outfit details to both looks for you below. I hope that this post has maybe given you some inspo on how to wear your jeans for different occasions. I mean after all where would be be without our favourite pair of skinny jeans? !